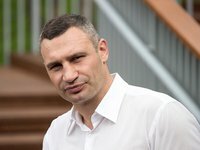 Kyiv's Mayor Vitali Klitschko will speak at the 10th Trade Day conference in Germany, Klitschko's press service has reported. "Kyiv mayor Vitali Klitschko will address the 10th Forum on foreign trade of North Rhine-Westphalia, which will be held in the German city of Aachen on September 20," it was said on Facebook page of Kyiv mayor on Wednesday. It says that the largest event in the foreign trade of North Rhine-Westphalia, which this year will gather for the tenth time, will be attended by about 1,000 participants. Representatives of more than 50 industrial and commercial chambers of Germany, leading German companies that carry out foreign trade activities, as well as market experts will be among them. "The topic of the forum is "World Trade in Changing World." There will be panel discussions and seminars such as: "Customs 4.0," "Quo Vadis China business? ", "Brexit: The Countdown,"etc.," it says.